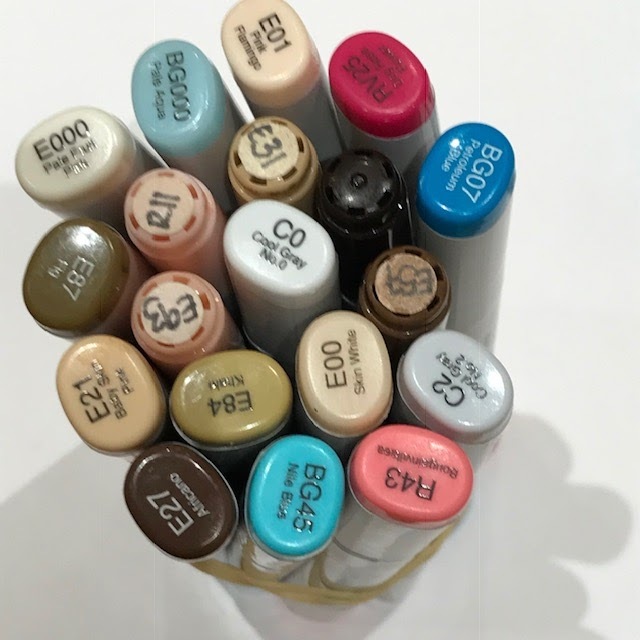 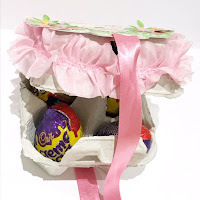 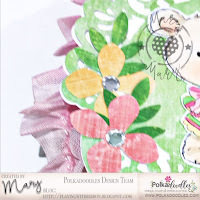 There is a new 'anything goes' challenge over at Polkadoodles Digi Choosday Challenge with a nice prize for the winner. I hope you will find time to join us and if you pop over to the blog I'm sure you will be inspired. 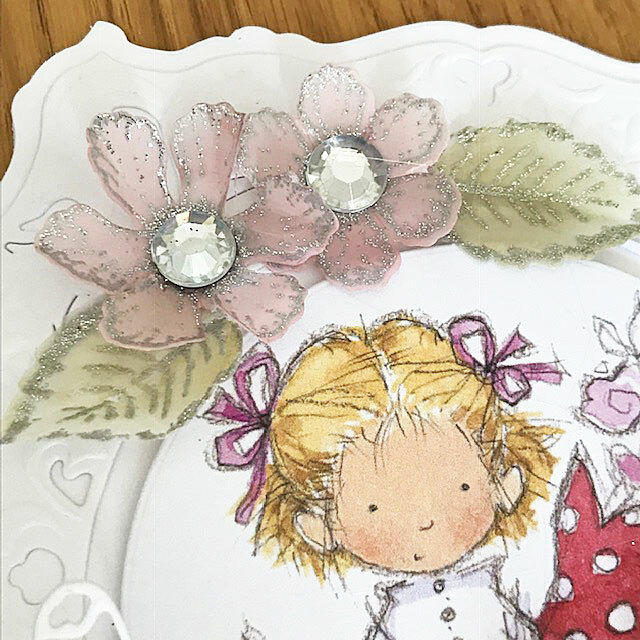 The DT were tasked with creating a project with the theme of 'Looking forward to Summer' and I thought this lovely digi stamp of Helga Hippo with her gorgeous summer hat would fit the bill perfectly. 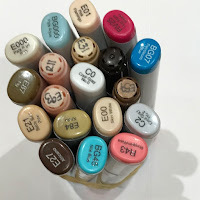 When I'd downloaded and printed out the image I coloured it with Copic markers. 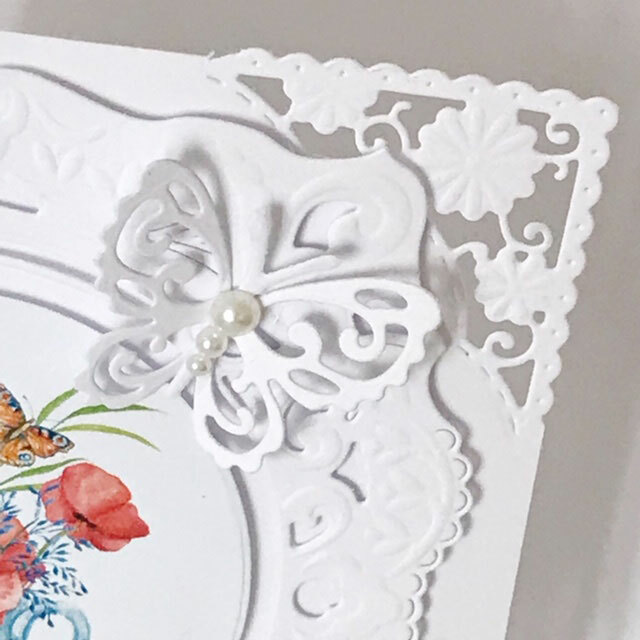 I die cut the image and matted it onto various diecut shapes then added some summer flowers which I stamped and diecut from Polkadoodles digital paper from the Starfish/Sandcastles collection and added a sparkly gem in the centres plus some diecut white leaves. 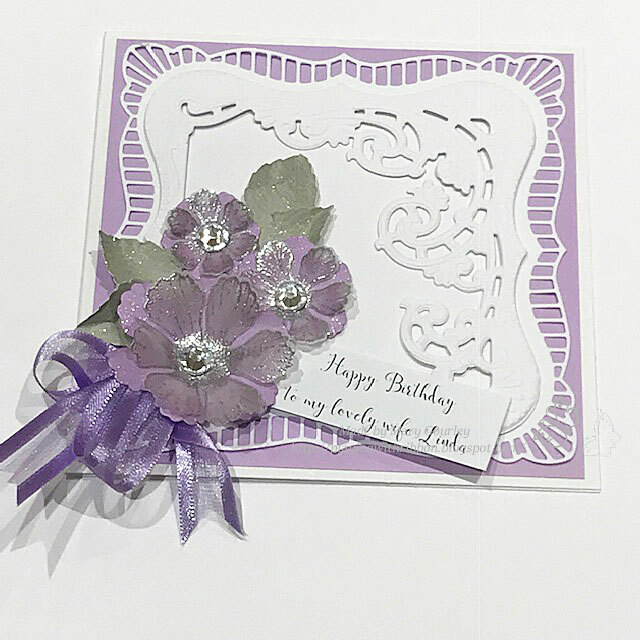 A birthday card with a pre-coloured image digi download image 'Helga the Hipp' by Polkadoodles on an oval diecut (Marianne large oval) and some die cut leaves with embossed vellum and paper flowers. 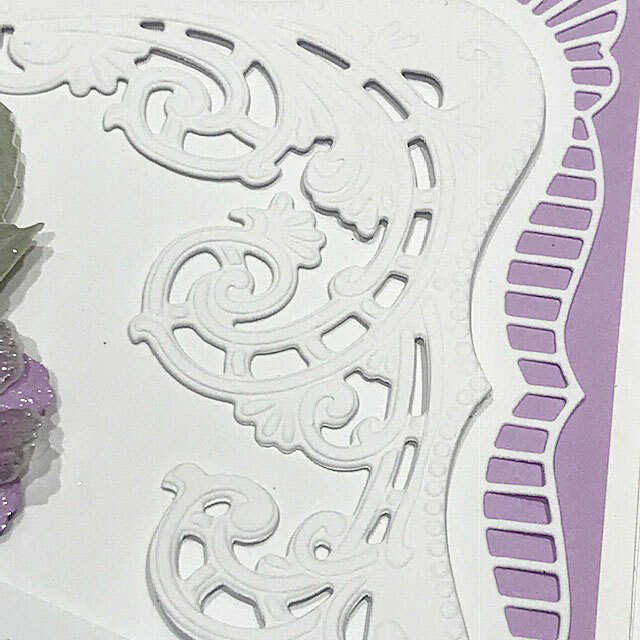 This photo shows the 3 pieces in a row - you cant see the diagonal fold on the front piece as there is a decorative panel added on top of it with the diecuts, flowers, ribbons etc. 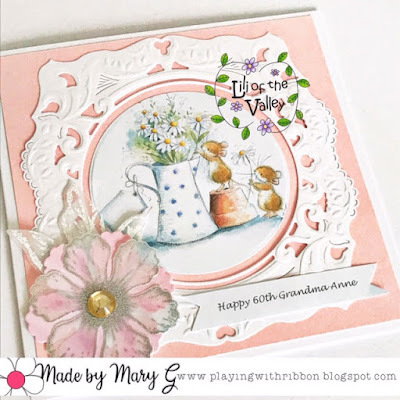 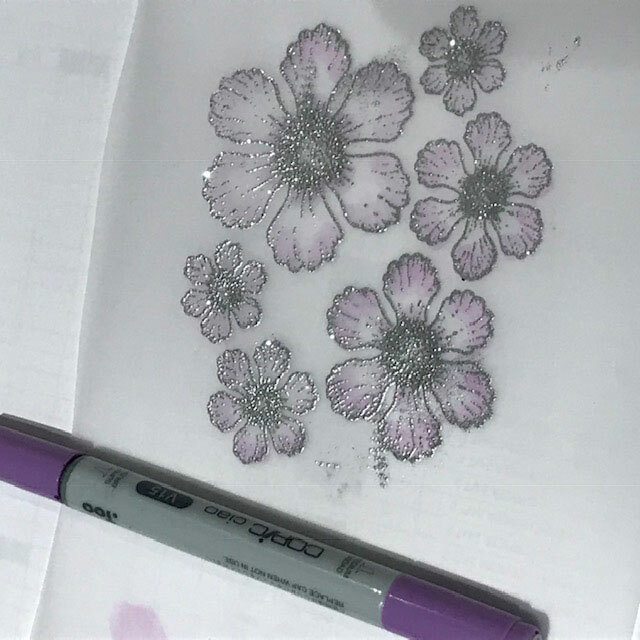 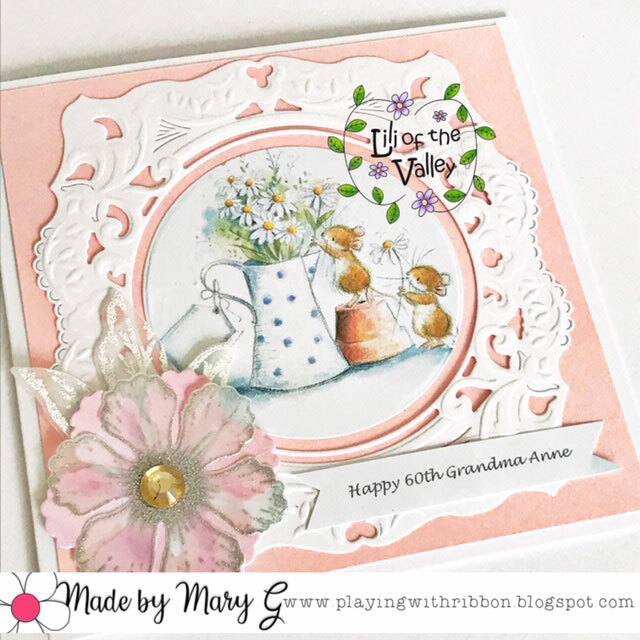 I used a Marianne Design die LR0578 on a pale pink background and added a pink paper and silver embossed vellum flower with a s/a gem in the centre. The sentiment was computer generated. I was inspired by a lady on the Marianne Design facebook group who made a similar card (Alie de Blieck) and I made this card using one of the older ready coloured LOTV images 'A teacup of poppies' I used Marianne dies LR0578, LR0537 on the corners and then I made some silver embossed paper and vellum flowers using my Heartfelt Creations stamp and die set. 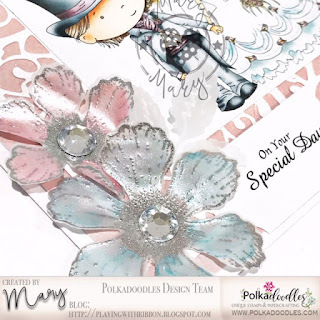 There is a new 'anything goes' challenge over at Polkadoodles Digi Choosday Challenge with a nice prize for the winner. 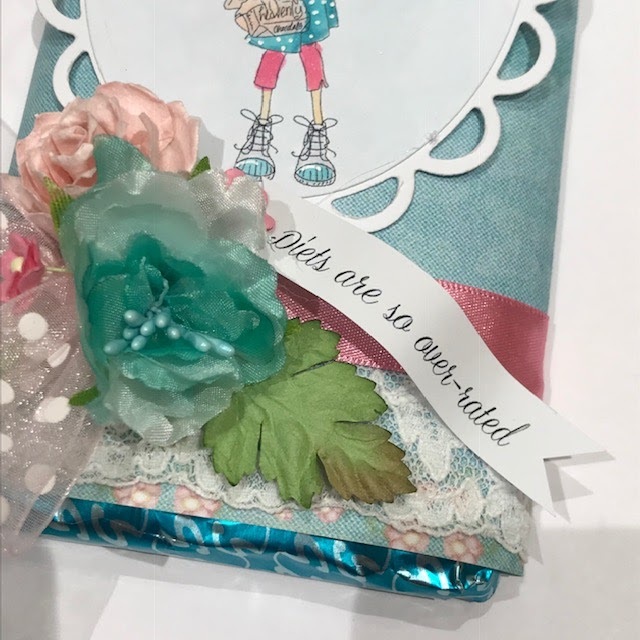 I hope you will find time to join us and if you pop over to the blog I'm sure you will be inspired. The DT were tasked with creating a project with the theme of 'a gift for a lady' so I thought what could be nicer than a bar of chocklit! yummy!! 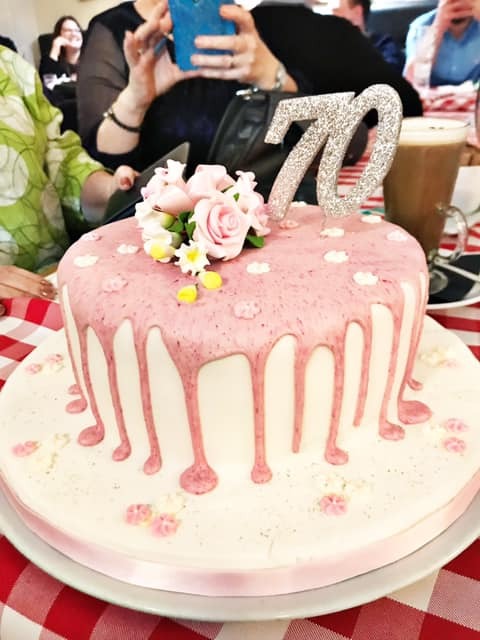 My gorgeous birthday cake made by my very clever little sister Jackie Bainbridge - it was a lemon and buttercream layer cake and tasted delicious! 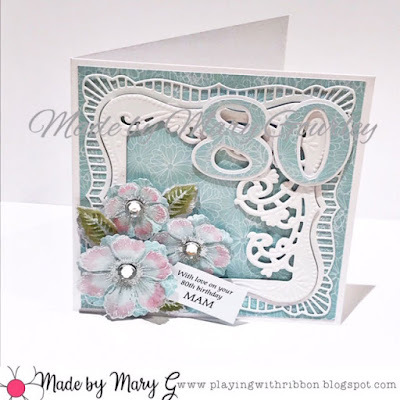 I was asked to make a card for an 80year old lady and I used a Marianne Designs die LR0578 cut in white and laid onto some gold glitter card. I used various flowers and leaves from my stash and added a bow made from ivory sheer ribbon. 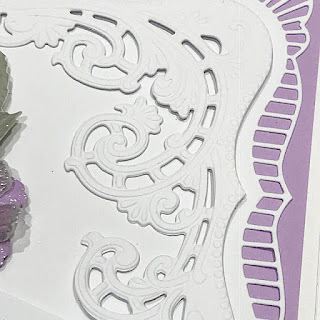 I die-cut the 80 in gold and matted onto the corresponding white background. 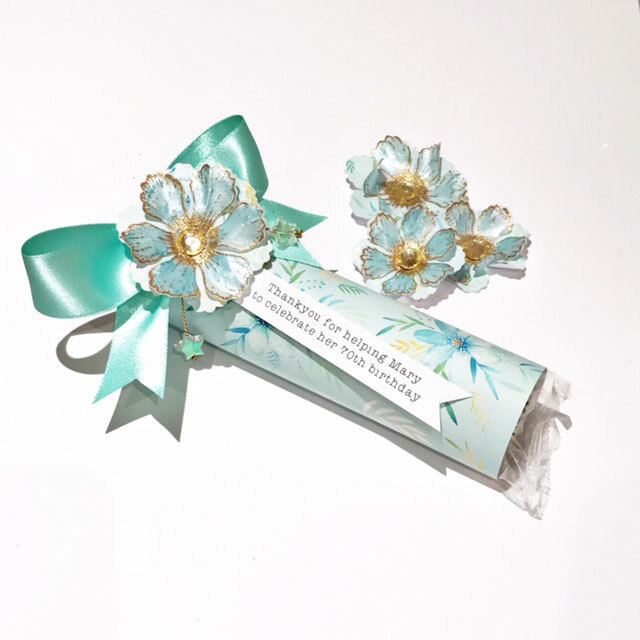 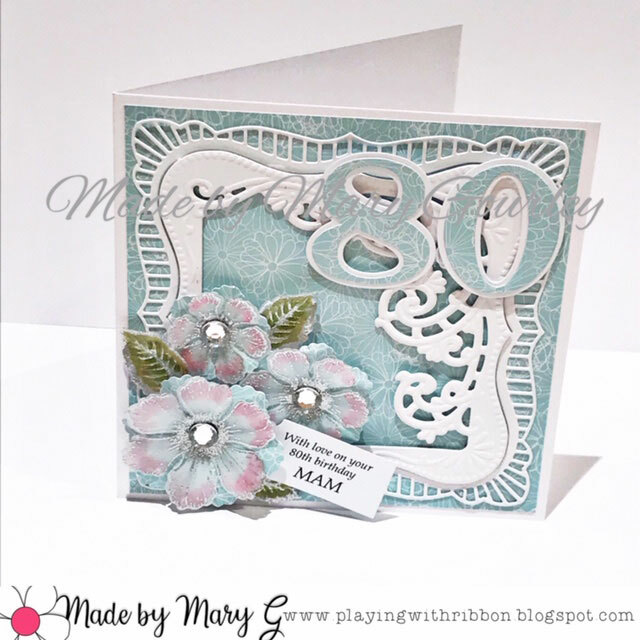 A birthday card in aqua and white using the Marianne LR0470 creatables die set with an 80 using sizzix numbers, two sizes so they nested together. A wedding card with the gorgeous Polkadoodles image love-kisses from the Work & Play digi bundle. 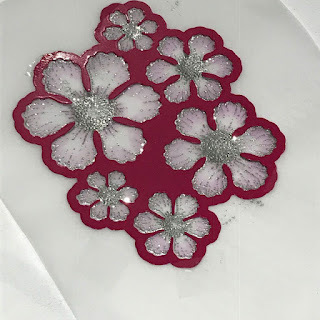 I made a white die cut, sorry no idea of the make, and matted it onto pink pearly card. 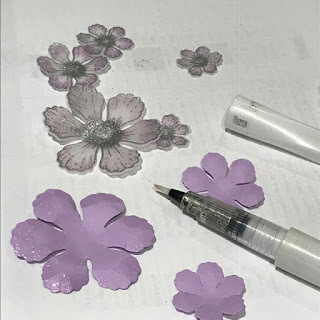 I love to try something new and I saw some lovely flowers on a facebook group made from vellum paper which had been painted with acrylic pearl paints - off to Hobbycraft where I got a couple of small bottles of Pebeo pearlised acrylic paint and one much bigger bottle for around £2 which is a metallic finish paint - both gave excellent results and a love sheen to the petals. 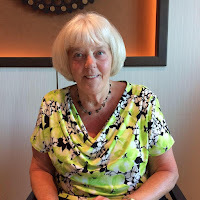 Thanks to Bozena Beijer for inspiring me again. 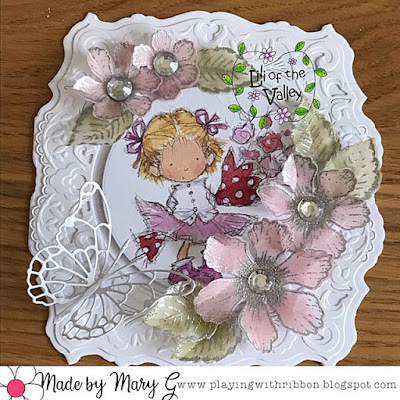 A close up of the pretty flowers which tone with the gorgeous Polkadoodles image as well as the background pink pearl card from my stash. 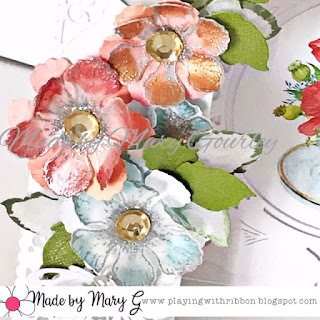 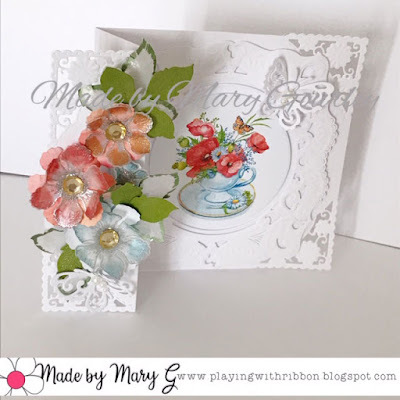 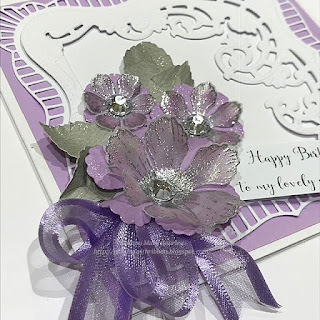 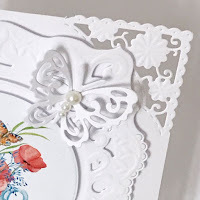 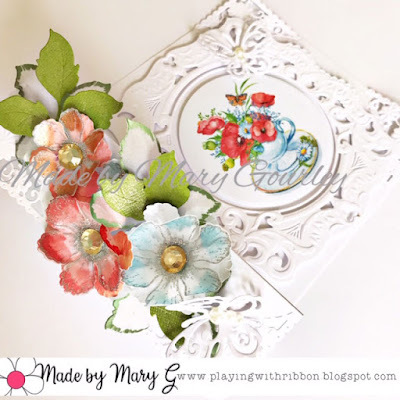 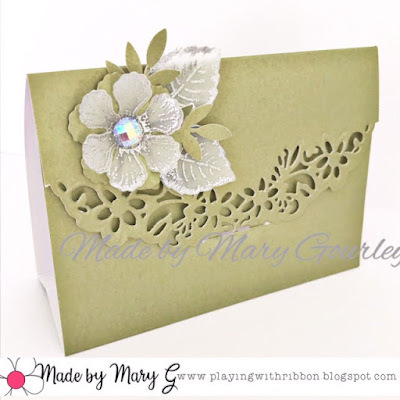 A birthday card using dies from the Marianne Designs LR0470 set plus vellum flowers (see below for how I made them) stamped and heat embossed using Heartfelt Creations dog rose set, which I then coloured with a Copic Marker. 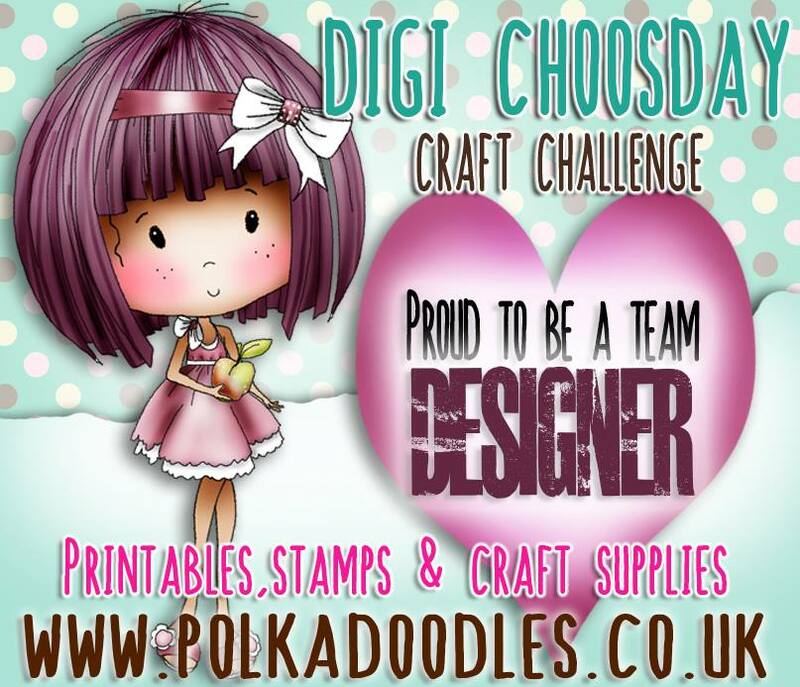 Proud to be a Member of the Polkadoodles Digi Choosday Team! !